Revisiting Soup for the Oprah & Diana Nyad Encore Show! January’s ‘Soup for Super Soul Sunday‘ follows OWN Network’s lead, with an encore soup recipe. I am tempted to share one of the soup concoctions we enjoyed at home this week – ‘spicy chorizo, potato & peppers’, ‘cabbage tomato vegetable’ or ‘thai chicken with egg noodle’. My soup cravings are very much weather sensitive. These substantial soups reflect the past few days the frigid winter weather! The recipes will be happily written here in the coming weeks to coincide with new Super Soul Sunday programming. 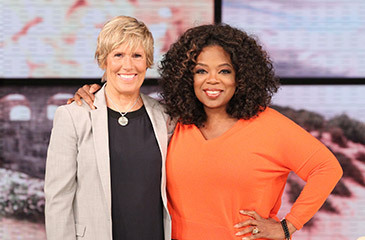 Watch Diana Nyad’s repeat conversation with Oprah, as she discusses her complex life with a full, resonate voice. Her strength is riveting and I am so inspired by her story. This woman is FIERCE! If it is cold where you are this week, then this week’s Potato Leek Soup will hit the spot! Tasty, easy and delicious. Enjoy! 1. Cover bottom of pot with the olive oil and heat. 2. Add the leeks and saute for 5 – 10 minutes. 3. Add the cut up potatoes and stir. 4. Cover the vegetables with either broth or water and heat to boil. 6. Cool then using a blender or hand emulsifier, puree until smooth. 7. Add the milk or cream then salt & pepper to taste. 8. Warm through until heated and ENJOY! Previous postRe-Visiting Sue Monk Kidd and Curried Squash Soup!